The value of a lease agreement is stated right on its face. But that’s not what a landlord is going to get if there’s a breach. Although there is a lump sum owed for the agreed-upon term of the lease, that figure is misleading for landlords who think they can bank it. In fact, landlords seldom are able to enforce that amount from a lease-breaking tenant. That’s due to a rule of law called the duty to mitigate. This rule applies to virtually all residential leases, despite the language in the agreement itself. It provides that when a landlord suffers a loss, like a lease-breaking tenant, the landlord must take all reasonable steps to lessen the financial blow. There simply is no sitting back and waiting for the lease term to end while the rent accrues. While landlords generally can’t terminate a lease agreement without cause, tenants may be able to leave for no good reason, and with minimal financial responsibility. Because of the duty to mitigate, landlords automatically lose the lease-breaking game. That’s not to say that tenants won’t be accountable for any of the losses. Landlords can pursue deadbeat tenants for damage to the property, as well as rent lost while searching for a new tenant, the costs of acquiring that new tenant and possibly for any shortfall if the rent must be lowered. But all that hinges on a tenant not having good cause to leave the property, like habitability issues. If the landlord has been lax on repairs or the property suffers conditions like pest infestations, the amount owed by the tenant may be offset by what the tenant is owed. While damage caused will be charged to the tenant, whether an individual landlord can deduct those charges from the tenant’s security deposit or rent deposits must be determined on a case-by-case basis. It may be necessary for the issue to be determined by dispute resolution. There are local rules for handling security deposits. For instance, if the landlord hasn’t given proper notice of the deposit deductions, it may be illegal to take the money without an order. The best practice for all landlords is to rely less on the lease agreement, and more on their tenant screening skills. Make it a priority to look for tenants who have a good rental history. This is demonstrated by a list of previous addresses that does not show unusual lease terms or gaps in the rental history. Record your expenses, including all damage to the unit prior to restoration and re-letting to a new tenant. Track your advertising expenses and the cost of tenant screening. Keep a record of the responses you receive from ads to prove how long it takes to find a new tenant. Include a list of applicants rejected in the process. You must act with diligence to fill a vacancy, but you don’t have to lower your standards. Collect receipts, not just estimates of damage. Include a record of all of your time and employee time, if any, expended on restoring the unit and finding a new tenant. Make sure your rental application captures the information needed to collect a judgement against the tenant. That includes verification of the tenant’s legal name, employer, bank info, credit and personal references. Despite the duty to mitigate, the law does strive to restore a landlord to the place they’d be in if the original lease were completed. 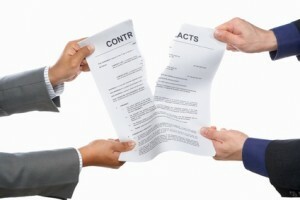 With a little work and good documentation, that can still occur, even when the tenant breaks a lease. Careful tenant screening can prevent the problem in the first place.